Alex Maguy, Paris, by December 1958. Acquired from the above by Christian Fischbacher circa 1961. I. Rouault & B. Dorival, Rouault, Catalogue raisonné de l'oeuvre peint, vol. II, Monaco, 1988, no. 2448 (illustrated p. 256). The present work belongs to a series of paintings of female 'types' that Rouault executed between 1949 and 1956. The subjects of these dozen or so works are taken mainly from historical and literary sources, many of them somewhat obscure, including Blanche-Neige, Manon, Monique, Yoko and Mercedès. Théodora may refer to one of the Empresses of Byzantine, possibly the 6th century prostitute turned wife of Justinian I who initiated widespread legal reforms to benefit women, wives and mothers, as well as instigating social policies to protect and assist prostitutes. 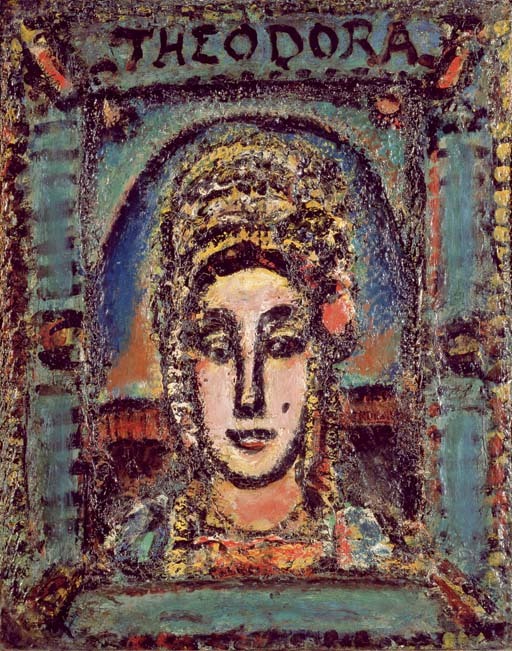 This choice would be particularly poignant given Rouault's abandonment after 1930 of the theme of the brothel and prostitute, seemingly to replace them with nobler, more spiritual depictions of heads and busts of girls such as the present work. Rouault's late style is characterised by a thick, layered application of paint, a brighter, more contrasted palette and a greater clarity of subject matter. The resulting works are rich in texture and sculptural relief, which is further accentuated by the fictive frame running around the main subject and the name of the sitter inscribed along the top of the painting. The framing of Théodora's head with a semi-circular arch that Rouault mainly employed for his depictions of Christ and the Sainte Face lend the present work an air of majesty that is reinforced by the rich headdress and attire that recall Théodora's appearance in a 6th century mosaic in the Basilica of San Vitale in Ravenna.